Hypothermia occurs when the core body temperature falls below 35ºC (95ºF) due to primary exposure (eg, environmental exposure) or secondary to other pathologies. Infants, children, and adolescents are at higher risk for primary cold injuries due to a combination of physiologic and cognitive factors, but quick rewarming and appropriate disposition can result in survival and improved neurological outcomes. 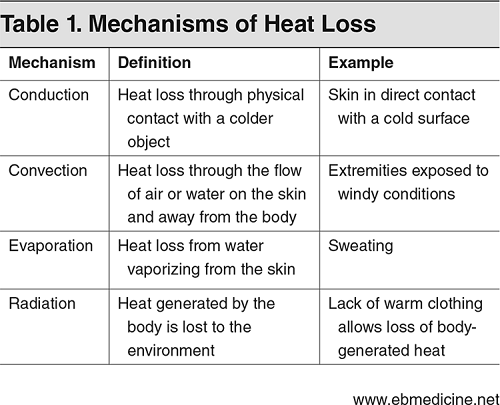 Treatment for cold injuries is guided by severity and can include passive or active measures. This issue reviews the stages of hypothermia and offers recommendations for emergent management of pediatric patients with hypothermia; guidance is also provided for the identification and management of frostnip and frostbite. An EMS call comes in to your ED: “7-year-old girl drowning in a frozen lake. ETA now.” EMS personnel then rush into the trauma bay with CPR in progress. The paramedic reports that the girl had wandered away from her family, who found her 90 minutes later on the bank of a nearly frozen lake. The girl had no pulses on EMS arrival, so they started CPR and brought her straight to the ED. On examination, she is in wet clothing, has no signs of trauma, is pulseless, and has an initial rectal temperature of 23.8ºC (74.8ºF). As you prepare for intubation and continue CPR, you try to control your racing mind and prioritize. What are the best ways to rewarm this patient? What lab tests should you be ordering? Does she need ECMO? A 17-year-old boy comes into your ED complaining of numbness and hardening of his fingers. He is a previously healthy foreign exchange student who is staying with a host family. The symptoms started yesterday after he went snow skiing for the first time. He says he wore gloves, but he was having a hard time holding the ski poles, so he took them off midway through the day. On examination, the fingertips on both of his hands are firm to the touch, have a dark discoloration, and are without sensation. The firmness and discoloration extend only to the distal interphalangeal joint in most of the fingers, but to the proximal interphalangeal joint in the middle finger of his left hand. The thumb on his right hand has a sizeable blister. As you step out of the room, you shake your head at the idea of skiing without gloves and contemplate the next steps. How do you classify the severity of his cold injuries? Does his thumb need debridement? Should you consult a hand surgeon and/or the burn center? What is the long-term prognosis for his injuries? Pediatric cold injuries can be generalized, as with hypothermia, or they can be localized, as with peripheral injuries. Pediatric patients are at higher risk for cold injury due to their smaller ratio of body mass to body surface area.1 An understanding of the pathophysiology of cold exposure is necessary to identify the treatment goals for an injury. The appropriate management will vary greatly, depending on the severity of the exposure. This issue of Pediatric Emergency Medicine Practice describes the workup and emergent management of primary hypothermia in pediatric patients. It provides guidance for prompt diagnosis and management strategies for stabilization, and recommendations for transfer to a pediatric referral center when necessary. A literature search was performed in PubMed using the search terms hypothermia, extracorporeal membrane oxygenation, cold injury, and pediatrics. The search identified 16 review articles and 38 clinical trials; of the clinical trials, 31 pertained to prevention of hypothermia and induced hypothermia in neonates and preterm infants. 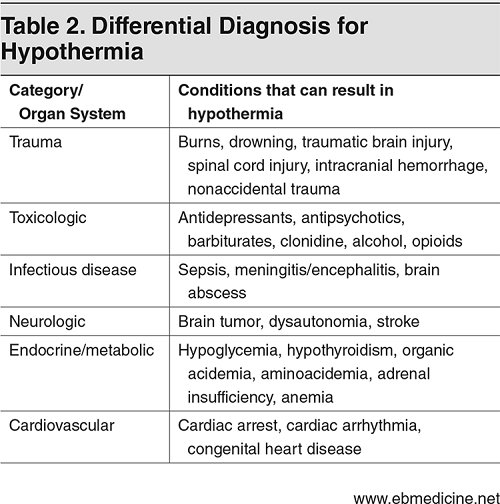 There is a dearth of literature on the treatment of severe hypothermia in the pediatric patient. Many recommendations are extrapolated from case series and animal studies. Continuous temperature monitoring will indicate whether the interventions are working or more aggressive therapy is needed. Having an appropriate probe for monitoring core body temperature is imperative; the temperature measurement method may need to be changed, based on the rewarming method being used. Do not forget to prewarm isotonic fluids before administering a bolus. Cold IV fluids can cancel the benefits of other rewarming therapies. If there is time, prewarm the fluids so that they are ready on the patient’s arrival. If you identify a patient who needs ECMO and it is not available at your center, transfer the patient as early as possible. Contacting the ECMO center yourself can help facilitate the transfer and prepare the accepting hospital’s ECMO team. As a hospital system, performing in situ simulation for a critically ill patient in need of ECMO will help prepare for the infrequent times it occurs. For high-acuity, low-frequency emergencies like this, simulation can identify process and management issues in your hospital. Pediatric patients are at higher risk for cold injury due to their smaller body mass-to-body surface area ratio and limited glycogen stores to support heat production, which can lead to metabolic acidosis, increased oxygen consumption, and brown fat breakdown in pediatric patients with cold stress. Always consider secondary hypothermia due to comorbid conditions (eg, sepsis, ingestion, dysautonomia, hypoglycemia). Consider using 2 or more sites of temperature measurement while rewarming a patient. Esophageal and nasopharyngeal probes may be the most reliable. If those are not available, bladder temperature measurements are more accurate than rectal temperatures. Assess central pulses in pediatric patients with hypothermia, as peripheral pulses may be undetectable due to peripheral vasoconstriction and bradycardia. Develop a general management plan for pediatric patients with mild, moderate, and severe hypothermia. Date of Original Release: January 1, 2019. Date of most recent review: December 15, 2018. Termination date: January 1, 2022. Faculty Disclosures: It is the policy of EB Medicine to ensure objectivity, balance, independence, transparency, and scientific rigor in all CME-sponsored educational activities. 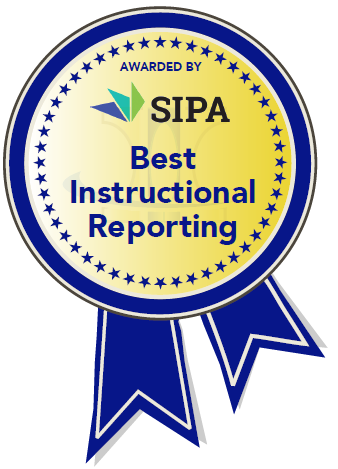 All faculty participating in the planning or implementation of a sponsored activity are expected to disclose to the audience any relevant financial relationships and to assist in resolving any conflict of interest that may arise from the relationship. Presenters must also make a meaningful disclosure to the audience of their discussions of unlabeled or unapproved drugs or devices. In compliance with all ACCME Essentials, Standards, and Guidelines, all faculty for this CME activity were asked to complete a full disclosure statement. ​The information received is as follows: Dr. Shah, Dr. Madhok, Dr. Macnow, Dr. Yoshida, Dr. Mishler, Dr. Skrainka, Dr. Claudius, Dr. Horeczko, and their related parties report no significant financial interest or other relationship with the manufacturer(s) of any commercial product(s) discussed in this educational presentation. Dr. Jagoda made the following disclosures: Consultant, Daiichi Sankyo Inc; Consultant, Pfizer Inc; Consultant, Banyan Biomarkers Inc.